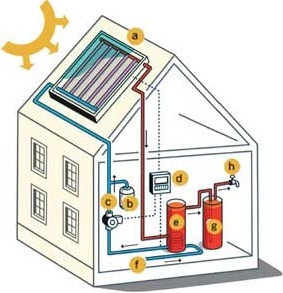 Solar water systems use the solar energy in daylight to heat water for use in our homes and businesses. A solar water (or solar thermal) system requires only daylight to work and will efficiently heat your water even on the cloudiest of days. It works by capturing the energy in daylight to heat a fluid in the solar water collectors (solar panels) fitted to your roof. This hot fluid then flows from the solar water collectors to a hot water tank inside the property, heating the water in the tank as it flows through and then passing back out to the collectors to repeat the cycle. In the summer months the hot water provided by the solar water system will meet all of your hot water needs. In the winter months the solar water system will pre-heat your water, meaning less gas or electricity is needed to get it up to temperature. Saves money by reducing your energy bills. A typical house spends 20-25% of their energy bills on heating water. A 3-bed house with a 4m² solar water panel system installed including a new hot water cylinder will cost approximately £3500 – £4500. This system would save around 0.5 tonnes of CO2 emissions every year (10% of the average emissions resulting directly from the house). The household will also save around £150 per year on their heating bills, more if oil and gas prices increase. Solar water systems are also ideal for heating your swimming pool and can provide significant cost savings if you are switching from an oil system. With payback periods as short as three years they make a great investment. Ground source heat pumps use pipes buried in the garden to extract heat from the ground. This is usually used to heat radiators or under floor heating systems and hot water. Beneath the surface, the ground stays at a fairly constant temperature, so a ground source heat pump can be used throughout the year – even in the middle of winter. Air source heat pumps absorb heat from the outside air This is usually used to heat radiators, under floor heating systems, or warm air convectors and hot water in your home. It can extract heat from the air even when the outside temperature is as low as minus 15° C.